By a fateful accident of texts exchanged between me and a pal we ended up dining at Coco Lezzone for what should have been a no-nonsense weekday lunch date. I suggested Coco Filippo and said pal replied “oh, you must mean Coco Lezzone!” Since I never heard of this trattoria before, truth be told, I wrote off Filippo and said to Lezzone we go! 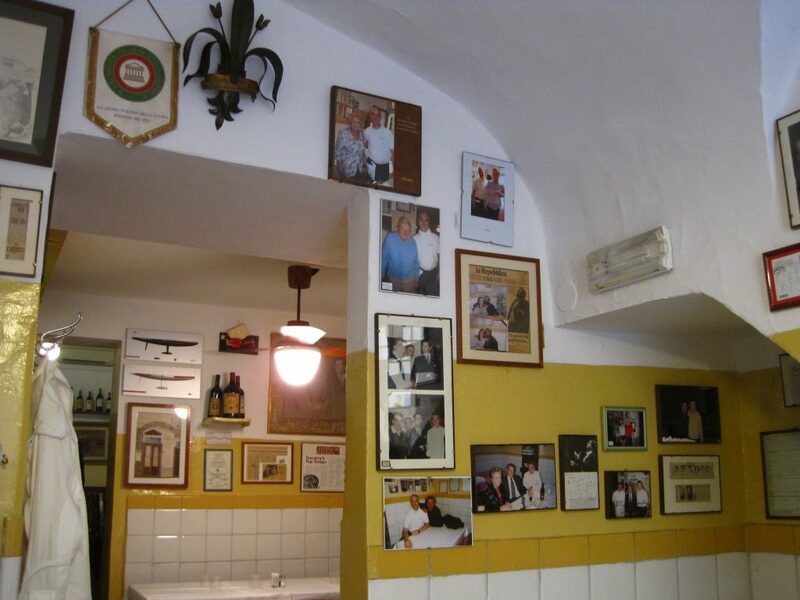 If there is a historical Florentine trattoria with delicious aromas wafting about, cute little grandmas inside peeling vegetables and a down-home kitchen with modest Italian time-capsule decor, I am mesmerized and charmed. This is how Lezzone hooked me in, inspiring my curiosity to peek around in the kitchen and quiz the staff on things like “where do you get your vegetables?” (the answer was Mercato San Lorenzo). My eating friend, with the same love for eateries with soul and procurement of timeless Tuscan dishes, I believe was captivated in a similar fashion. 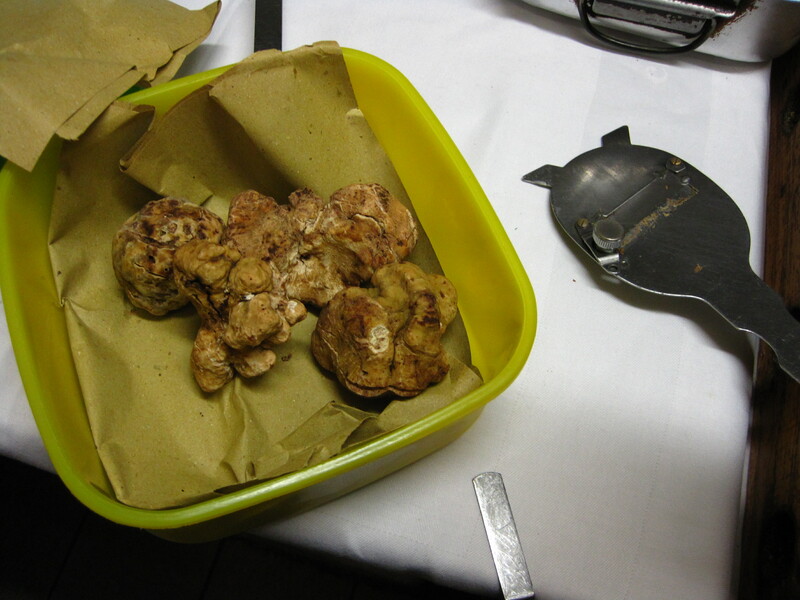 They were kind enough to let us peek around the kitchen and to sniff around, especially the umami gold mine of their San Miniato white truffles. 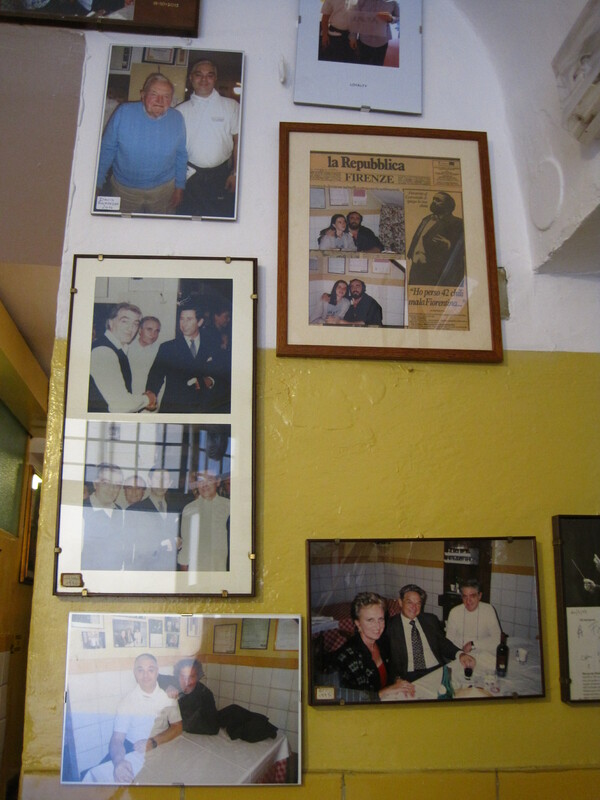 One of the grandma proudly points out photos of Prince Charles as previous diners hanging neatly on the wall, along with other members of notoriety such as Pavarotti throughout the decades. 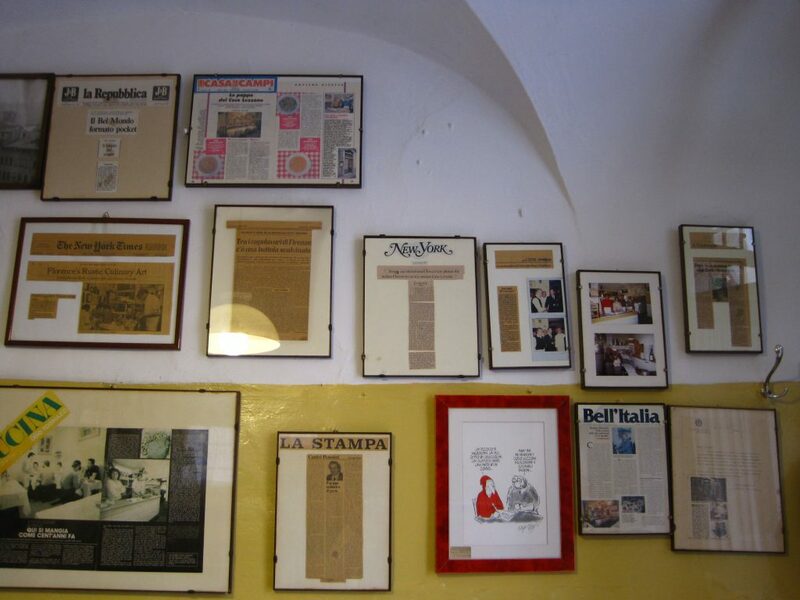 The walls adorned proudly with old newspaper clippings raving about what seems to be an “institution” of Florentine fare. We sit down and another nonna comes to take order. We ask for a menu, and almost as if I offended by asking as she firmly replied “I am the menu.” A human menu- now that’s a concept! She does explain the menu being out of date and lists off the primi including ribollita soup and various sauced pastas which are all farfalle, “butterfly” shaped. No fresh tagliatelle, maccheroni, pici or pappardelle which would actually be Tuscan albeit not terribly unique to Florentine cuisine. 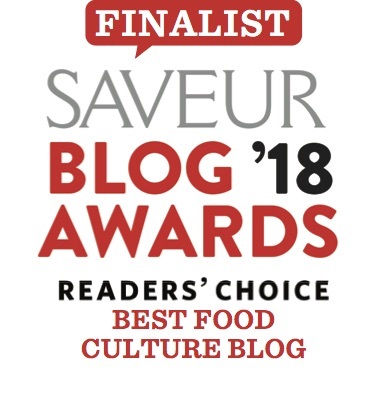 In one of these pastas she mentions truffle and so naturally we are sold, I took the peasant soup ribollita because I’m constantly on the search for the best bowl of it in Florence. 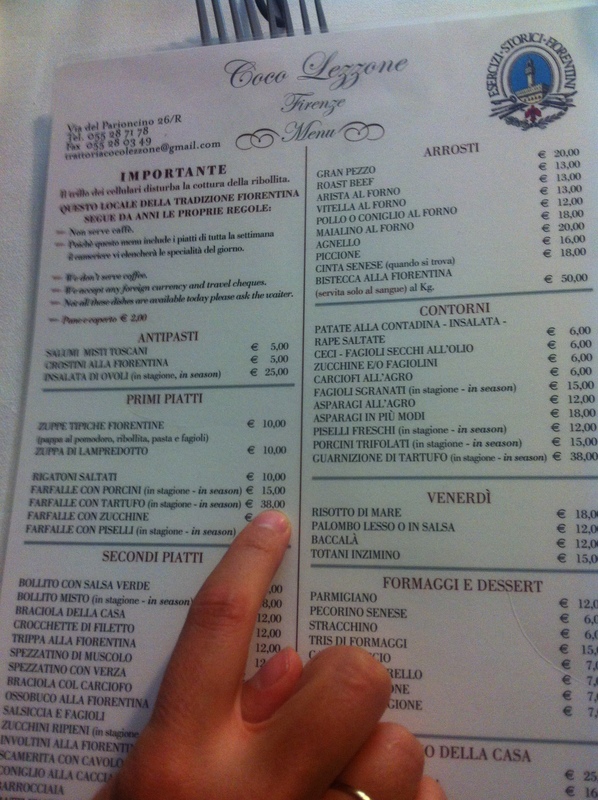 Whether this was a coincidence or not, the menu is sat on our table after we ordered and we were shocked to see our truffle pasta was listed at 38 euros. We attempted to call nonna over to cancel the order, but it was too late- the costly plate was already arriving. Probably the quickest money making dish they could have offered: some boiled dry pasta, shaved truffle on top and basta. A touch of butter so the noodles wouldn’t stick together. Granted, it made some sense for this plate to be more costly than the others. As you can see, there was a good blanket of white truffle stacked and layered in. 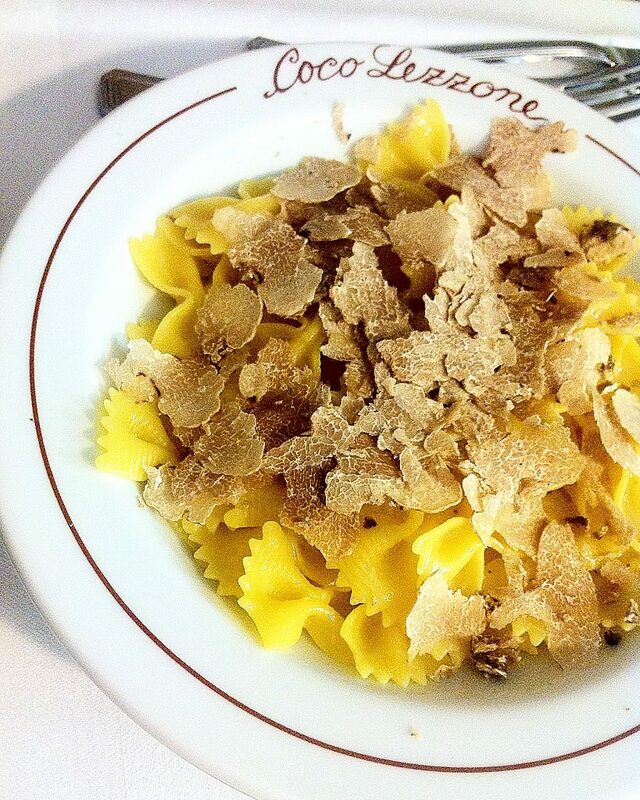 My friend told me that it may have be an expensive year for white truffles from San Miniato, however I still think that if you’re going to offer a luxury plate of truffle pasta- you can justify it with at least some fresh pasta and not some pre-packed dry pasta. I honestly didn’t think it was that heavenly, I’ve had fresh truffle from San Miniato shaved on fresh tagliatelle and this was bland in comparison I must say. the priciest plate of pasta I’ve ever seen a trattoria offer. That’s not the point. The point is that we asked for a menu and they didn’t give us one until after we ordered. 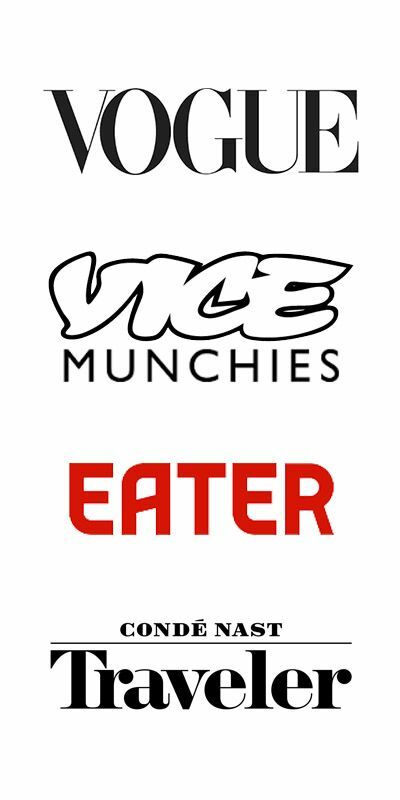 Their defense could be “some of the items aren’t on the menu, that’s why we offer human menus.” Some may say that is totally not legit and we could have walked out without paying and been in the right. 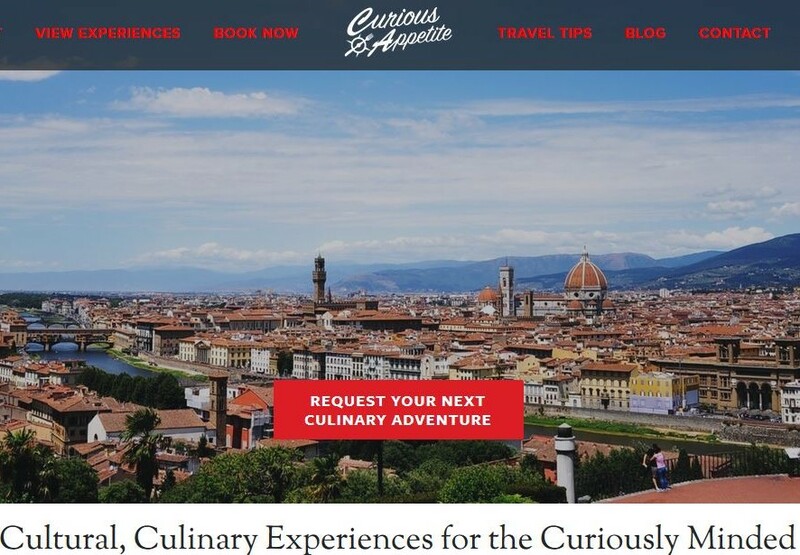 There are thousands of eateries in Florence and a good percentage of them have truffle somewhere on the menu which does not cost so ridiculously. Coco Lezzone is not a Michelin-starred restaurant and neither a fancy ristorante. This was a TRATTORIA- a place you expect casalinga cooking and traditional Tuscan fare which is no-frills/fuss and affordable. The point I want my readers to take away is this: If you ask for a menu and an eatery replies instead it’s a human version don’t give you one, ask for their prices. It’s not a rampant occurrence, so don’t worry if you feel like from now on you should be on your guard. Florence thus far hasn’t received the same reputation from the media concerning rip-off dramas erupted from Venice and Rome. the menu. a little too late. Despite what some people may think upon reading this, I feel that was not our fault for not asking the price. In Florence, it is completely normal to be provided questionable service and it’s somehow your fault. Here is a piece of reality for those who always wonder “what’s life like living in Florence?” You get used to bad or non-existent service, in fact you start to expect it. What I don’t expect is a trattoria selling a 38 euro plate of pasta! That being said, there are many eateries and bars in Florence with kind staff who are extremely affable and lovely. In fact, I’ve spent the last 3+ years on a mission to weed out the jerks, the sloppy food quality inconsistencies and only supporting eateries and bars where people don’t treat me or my guests/friends like a burden. You actually get so used to this unprofessional demeanor that when you go back to the states, you are baffled by someone asking “how you doing today?” in a setting other than a doctor’s office. There is a line between understanding you are in a city among millions of tourists and foreign students, some of who can be culturally insensitive. I get that it’s frustrating. But it is not our fault for expecting that you provide a menu when it is asked for or that a trattoria not serve us 38 euro pasta without explicitly warning us since supposedly all they had was a “human menu.” If you even go to their website, the front page says “la cucina economica” (affordable cuisine. Am I missing something here? The service was courteous and not bitter, they were indeed very sweet and pleasant. I’m almost confused by the negative tone to my experience here. I just don’t understand what went wrong with this undisclosed 38 euro plate of dry, packaged pasta with truffle and a mediocre, shyly dosed 10 euro bowl of ribollita. I was not extremely impressed with it and quite frankly, I felt the dosage was a bit weak and the point of a ribollita is that it’s cheap and filling. Combined with the fact their pastas are from a bag and not by hands, I’ll have to write off their primi (first courses) for now. However, I’m not the only one who has mixed reviews. I almost cringe to suggest this, but do check out their reviews on tripadvisor. 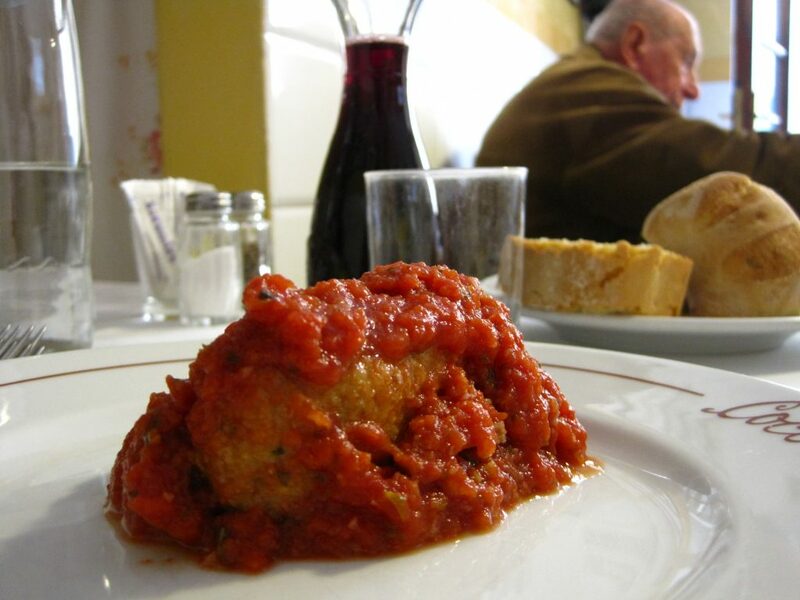 We also ordered a sort of ground filet “Crochette di filetto” in a mouthwatering, tangy savor-rich tomato sauce. They had baked these puppies (not actually made of puppy) in lieu of pan-frying them, which is also practiced. It seems that the second courses (meat-based) were on point. Juicy texture and specked with aromatic herbs. The mains would be worth going back for. However, just out of principle I’m not sure I’d ever return. Take what I have to say with a grain of salt. Is there anyone out there who has been to Trattoria Coco Lezzone? I’d love to know your thoughts and if you think this was just a series of unfortunate coincidences. I’d like to think it was, it seems like such a cute eatery and the mains would be worth a second chance. Hey! You! Did you make it to the very end? 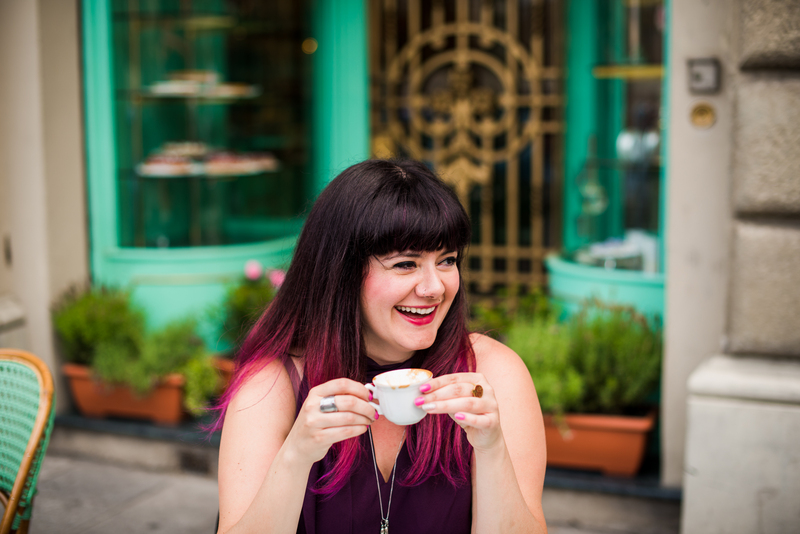 Why not come say hi on facebook, instagram and/or twitter? Let’s stay in touch for more gourmet news and food for thought- scroll up and subscribe by e-mail for more. Buon appetito! I had a very similar experience recently at Coco Lezzone – we ordered a wine from the 2009 vintage, which then wasn’t available, so they offered us the 2010 instead without mentioning anything about the price. This particular vintage was €35 more expensive than the 2009. We won’t be going back, its no way to treat your customers.